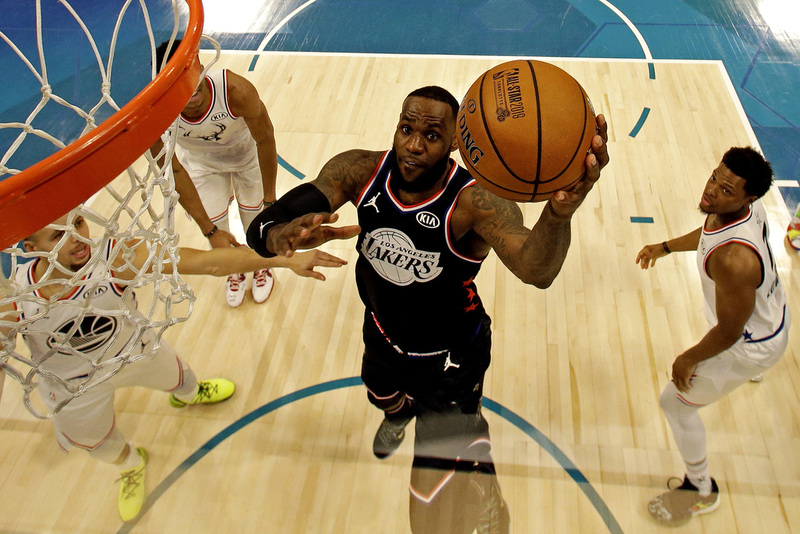 Lebron James of the Los Angeles Lakers (23) shoots the ball against Team Giannis guard Kyle Lowry of the Toronto Raptors (7) during the 2019 NBA All-Star Game at Spectrum Center in Charlotte, USA, Feb 17, 2019. LeBron James' move to the Los Angeles Lakers had all the makings of a Hollywood blockbuster. A veteran superstar joins a storied-but-struggling franchise and leads a dramatic revival that transforms the team into title contenders. But five months after James began training with the Lakers, the perfectly scripted finale has been stuck in what entertainment industry executives call "development hell". Since then, however, the Lakers have won nine games and lost 17, a slump that has seen them fall out of the playoff rankings into 11th spot in the West, three places adrift of the eighth postseason slot. Much of that slide can be attributed to James' prolonged absence due to a groin injury, with the 34-year-old missing all of January before returning for a 123-120 win over the Los Angeles Clippers on Feb 1. However, the Lakers have continued to struggle even with James back in the lineup. A chastening sequence of results has included the most lopsided loss of James' career, a 136-94 pounding by the Indiana Pacers, as well as dropping games to lower-ranked foes who have little to play for. The most recent of those came on Monday against the Memphis Grizzlies, who are second-last in the West with a 24-38 record. James appeared to question his teammates' focus after the 110-105 loss, suggesting that any player unable to cope with the pressure of chasing a playoff berth should find another club. "At this point if you are still allowing distractions to affect the way you play, then this is the wrong franchise to be a part of and you should just come and be like, 'Listen, I don't think this is for me'," James told reporters. That sort of comment is unlikely to endear him to a squad that has reportedly been in turmoil since the team's pursuit of New Orleans Pelicans star Anthony Davis ended in failure in early February. The Lakers were reported to have offered several prominent players in exchange for Davis, including Lonzo Ball, Kyle Kuzma, Brandon Ingram, Josh Hart, Ivica Zubac and Kentavious Caldwell-Pope. James, meanwhile, had earlier spoken favorably of a possible linkup with Davis, saying playing alongside the Pelicans ace would be "amazing". The perception that the Lakers' pursuit of Davis was going ahead with James' blessing was pounced upon by rival fans. Ingram was subjected to taunts of "LeBron's gonna trade you!" during the lopsided loss to Indiana on Feb 5. An unnamed NBA executive believes James bears some of the responsibility for the Lakers' problems by making no secret of his admiration for Davis. "He killed the Lakers' chemistry," the executive said in an interview with Bleacher Report. "He shouldn't have been so public about it." But other pundits believe the Lakers' problems are linked directly to James' fitness and his lengthy injury layoff. "The single biggest problem with the Los Angeles Lakers at the present time is LeBron James," Stephen A. Smith told ESPN's First Take show. "Age, attrition or injury. Something is not right. He doesn't look like himself." James has always cautioned that rebuilding the Lakers would be a long-term project, stating in September that he anticipated "bumps and bruises" as the team attempted to rebuild after missing the playoffs for five straight seasons prior to his arrival. But the 16-year veteran and three-time MVP of the Finals must now conjure something remarkable over the final weeks of the regular season if he is to avoid missing the playoffs for the first time since 2005. The Lakers face a brutal stretch that includes games against Boston, Denver, Toronto and Milwaukee. A daunting final six-game run wraps up the regular season, with the Lakers playing New Orleans, Golden State, Oklahoma City, the Clippers, Utah and Portland.